A professional performance extended Sids’ good recent run of results with victory over well-organised Worthing. The visitors were full of confidence after a midweek win over Seaford but after a fairly even opening quarter of the game the home side began to control proceedings. Sids should have been in front on 20 minutes, but Ben Mepham, clean through on goal, shot tamely at the keeper. Mepham turned provider with a superb pass that released Dave Rough. His effort beat the keeper but it was just too high and went over. The same two players redeemed themselves as they combined for the opening goal as a Mepham corner was slammed home by Rough to give the home side a deserved half-time lead. The second half was just a minute old when Mepham slotted home from the edge of the box to round off a fine passing move. Sids were fully in control and should have added to the scoreline with Boulton, Mepham and new signing Jono Fryatt, who came off the bench, all squandering good chances to increase the lead. At the other end, Sids defence were Scrooge-like in their defending, allowing the visitors precious little to work with and leaving home keeper Boyt largely unemployed. It was a comfortable win for Sids who face a much tougher task this Saturday when league leaders Steyning visit the Rec. Sids: Boyt, Lynch, Low, Madden, Corell, Agostinelli, Chittock, Smith, Mepham, Boulton, Rough. Subs: Fryatt, Butress, Dines. Selsey had to settle for a point at home to ten-man Littlehampton Town. Joseph Bennett opened the scoring for the Blues in the sixth minute, putting the ball past James Askew. But Littlehampton equalised seven minutes into the second half. Littlehampton’s Jack Hands was sent off ten minutes from the end, but the hosts couldn’t grab a winner. The result leaves Selsey still in fifth place, four points off fourth-placed AFC Varndeanians. It extends their unbeaten run to five games, with their last defeat coming on December 8. Selsey manager Daren Pearce said: “We weren’t as good as we have been in previous weeks. We were a little bit below par. The Blues do not have a game on Saturday, but travel to 11th-placed Wick on Tuesday. Wick are currently operating under caretaker managers Dan Cox and Luke Cooper. Selsey: Kelly, Mockford-Allott, Atkinson, Hambleton, Higgins-Pearce, Phillips, Dowdell, Bennett, Bassil, Jefkins, Morey. Subs: Miller, Hall. The Stags, who sit bottom of the table, started well, putting Billingshurst under pressure. The visitors took the lead against the run of play in the tenth minute as the Stags failed to clear a long ball played into the box, leaving a simple tap-in for Jake Chadwick. The hosts hit back and a immediate chance came as Jake Slater got free inside the box only for the onrushing keeper to bring him down. A spot kick was awarded and Kieran Carter sent the keeper the wrong way to equalise after 13 minutes. Midhurst’s Callum Coker missed two good chances to put the Stags in front. The visitors were growing into the game and looked dangerous on the break and had a good chance to go in front. Home keeper Joshua Bird misjudged a high ball only for Billingshurst to hit the bar. The rebound was smashed against the post. Three minutes before the break, the Stags conceded two goals. The first was calmly placed home by Billingshurst’s Ben Hands. The visitors doubled their lead on the stroke of half-time as Jeffrey Mahadoo tapped in a ball across the box. The Stags came flying out in the second half as Coker burst through in the opening minutes in a one-on-one, but striking the ball straight at the visitors’ keeper. 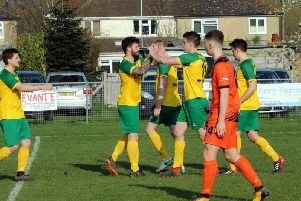 Billingshurst stretched their lead in the 65th minute with the ball hitting the referee and falling to a Billinghurst player who played the ball over top with Joshua Wycherley and Billingshurst’s Chris Spiers in a race. The Stags full-back got there first only to underhit a back pass to Bird, and Spiers nipped in and slotted home. The Stags reacted well, putting the visitors under pressure. Coker got through and slotted home with 20 minutes left. The visitors looked nervy and needed to produce some last-ditch defending. With three minutes remaining a half-cleared ball fell to Coker who slotted home, but it was too little too late for the Stags. Midhurst play their third home league game in a row when they take on Storrington this Saturday. Midhurst: Bird, Behan, Wycherley, R Carter, Farr, Brown, K Carter, Giles, Coker, Slater, Dreckmann. Subs: Scarbourgh, Penfold, Norgate, Wyatt, Casselton.